This three-week uptime survey of 11 social bookmarking sites shows 100% uptime for Digg, Fark, Slashdot and Netscape. Other sites are less fortunate. Digg and Del.icio.us are at the forefront of social media and web 2.0, but they are far from alone. They have plenty of competing services, and these social bookmarking sites are getting a lot of traffic. So much traffic, in fact, that some of them seem to be having website problems. This is the total downtime since May 3 for each of the 11 websites in the survey. As you can see, Digg, Fark, Netscape and Slashdot have all had perfect uptime records so far, and Del.icio.us isn’t far behind with just 5 minutes of downtime. Blinklist, on the other hand, has had more than 20 hours of website downtime in just these three weeks. The longest individual downtime for the Blinklist website was 4 hours and 46 minutes. One possible explanation to all this downtime could be that Blinklist is having scaling issues (a.k.a. growing pains). Sometimes there is a back side to being popular. 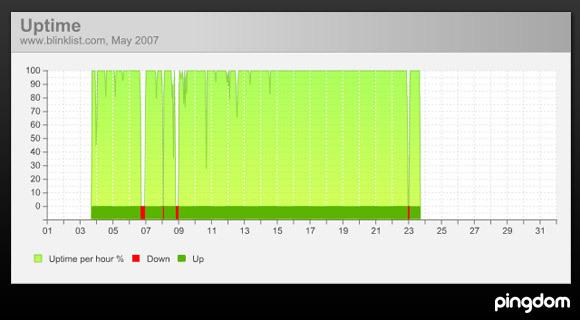 The website monitoring was performed by Pingdom – The Uptime Company.